I recommend you to go to this hotel if you decide to go to this fantastic city, because it is one of the best hotels I have ever been, anything you need you will find it in there. And I have to stop here, to talk about their food. Their wonderful food!. One of the things they taught us was how to do “papas arrugadas with mojo picon”. I cannot translate the name of this food because is its name what gives the essence of the Canary Islands. They could prepare this kind of food for us, and we tasted it. It was amazing I can promise you. What it is true is that it is not the same to eat food that is typical from one place outside that place, and eating it in the same place. Because the environment of the Canary Islands is special, so if you are there, with people from there, seeing their customs and everything from there, you will understan better the magic that these islands have. But anyway the experience we had with them was really nice. We learnt a lot of things from them, even new Spanish words we do not normally use. It is curious I do not know many thing about there and we belong to the same country. 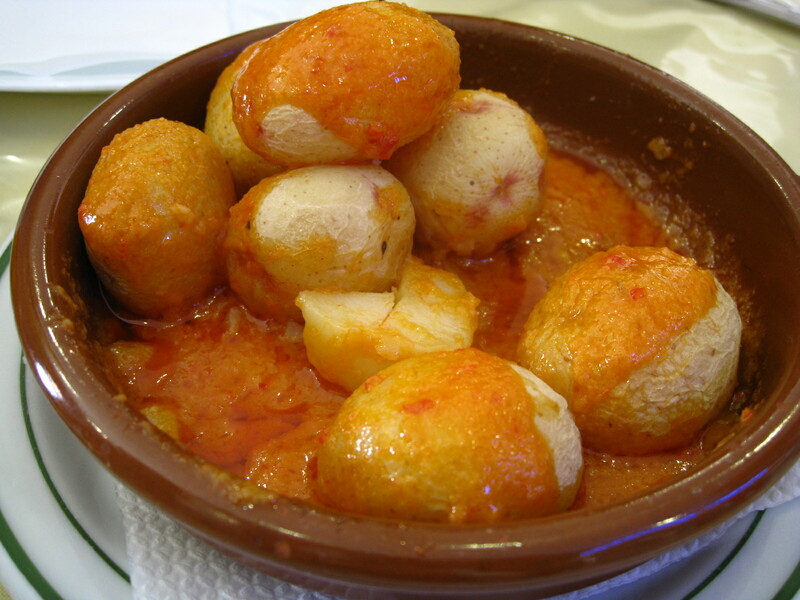 Talking again about the “papas arrugadas with mojo picon” I would like to tell you how to do them, because I am pretty sure you will love them. What we need is: 1kg of little potatoes, ¼ kg of salt, one piece of lemon and water. ·First of all we need to wash the little potatoes very well to clean them but we do not have to peel them! ·In a big pan we need to put them with some salt and a piece of lemon, we need to add water covering them, but not much. ·When they are cooked, we need to take the water out of the pan, and we have to put them again on the fire to dry them. ·When they are dry enough, we need to take them and cover them with a rag. ·The last step is to put them in a tray and add the “mojo picon” sauce. To make the sauce what we need is: 1 garlic, 2 spicy peppers, 1 little spoon of comins, 1 little spoon of paprika, 4 spoons of vinegar, 15 spoons of olive oil, and strong salt. ·In a pestle we need to add the garlic in little pieces and peeled, the strong salt, the cumin and some pepper, we mix everything until getting a dough. ·Now we need to add some paprika, oil and vinegar until we get a thick dough. One thing you need to take into account is that this sauce can be in de fridge for several months. If you use sweet peppers is also a good idea for not doing it so spicy, for those who do not like them. Anyway people can change the recipe so I would like to show you one video in which you can see one way of doing that fantastic food, and also because I know that is better if we see it instead of only reading and doing it. I hope you love it!